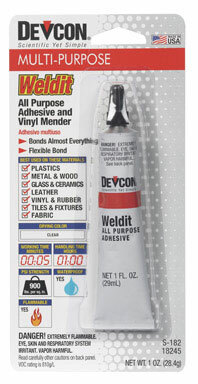 Description Devcon Weld-it Vinyl Mender Excellent all purpose adhesive sets fast and has bond strength of 900 psi. Use for bonding material like hard plastics, wood, metal, tile, china, glass and fabric. Great for repairing, mending and attaching vinyl.